In order of increasing central wavelength, the filters included within the catalogue are called UVW2, UVM2, UVW1, U, B and V. The final three filters are similar, but not identical, to the Johnson UBV set. A comparison of the effective areas of these filters with the GALEX and SLOAN sets is provided in Fig. 1 and the basic properties of the filters are listed in Tab. 1. A description can also be found in the XMM User's Handbook. Figure 1: Blue - the effective transmission curves for the lenticular filter sequence of XMM-OM. Green - the two broad-band GALEX filters. Red - the Sloan filters as used on the 4m Blanco telescope at the Cerro Telolo Inter-American Observatory. Table 1: XMM-OM filter properties. λmax is the wavelength at which the effective area peaks, Δλ is the wavelength range over which the effective area is greater than 10% of λmax. Zero-points are provided assuming a Vega source spectrum. FWHM is the typical full-width half maximum of a best-fit Moffat function to typical point sources, although the PSF does have a dependency on count rate due to coincidence losses. mv,max is the limiting V magnitude of an A0 type star observable by the OM without causing damage to the detector. Fields with sources brighter than this limit are not observed by the XMM-OM. A minimum of three colours are required to differentiate between stellar and galactic source populations, and quantify interstellar dust. 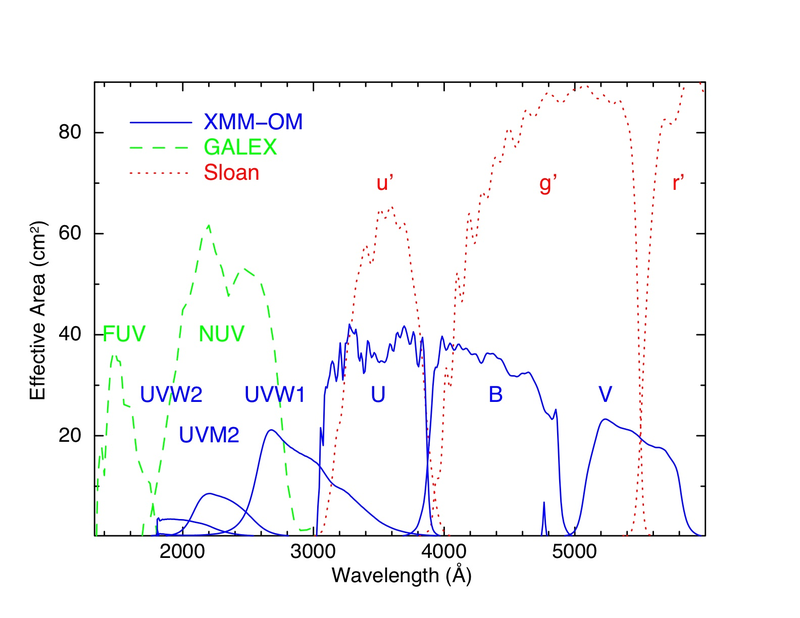 The XMM-OM provides up to six colours per catalogued source; three of those colours, UVW2, UVM2 and UVW1, span the GALEX NUV band and the UVW1 filter fills the gap between the GALEX NUV bandpass and the Sloan u' filter. Despite broader PSFs, the larger effective areas of the GALEX filters provide deeper zeropoints. The GALEX all-sky survey (AIS) consists of mosaiced, uniform 100s exposures with limiting depths of mAB = 20.5. Since the XMM-OM catalogue contains a range of exposures from 600-5,000s, the depth of the GALEX all-sky and XMM-OM source samples are similar and very compatible for joint science programs.